Lowdown: Aria's Omega Station is invaded by mutant Reapers that got away from Cerberus. 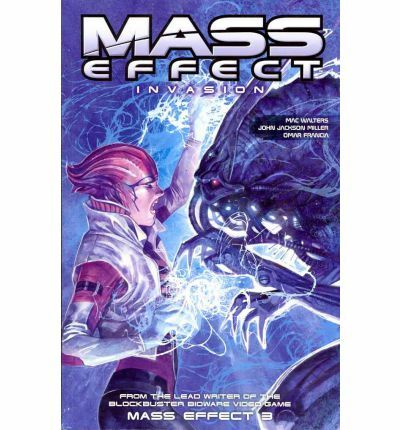 The last of the three currently available Mass Effect comic paperbacks, Mass Effect: Invasion features Aria T'Loak as its hero character in a subplot taking place between the events of Mass Effect 2 and 3 games. Omega Station is run by Aria, as we know well from Mass Effect 2. However, it is under a new threat that requires all of its seedy components to unite: mutant Reapers coming off the Omega 4 relay after escaping Cerberus labs built to investigate Reaper technology there. Cerberus itself comes to the aid of Omega Station, soon leading Aria to question who the real threat to her station is. The story and the graphics in Invasion are good. 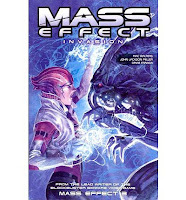 My five year old thoroughly enjoyed me reading him this comic, and I enjoyed it too: I would have said it is the best of the Mass Effect comic paperbacks released to date. Aria is definitely a good character to pit at the center of a story, there is nice gap filling with the Cerberus subplot, and the whole development of characters and plot is excellent (unlike Redemption, there is no babe-ification of the central character). I would have said it's the best of the lot, but I can't: sadly, Invasion has no ending worth talking about. Instead we are left off with a "and the story continues in Mass Effect 3". WTF? As someone who played Mass Effect 3 several times I can testify I do not consider this ending worthy, nor do I consider Mass Effect 3 to have supplied me with adequate finality to Aria's thread of the story. On the positive side, Invasion includes a short comic bonus of a story, Conviction, which tells us a tiny bit about James Vega and his card playing antics. Sadly, I found its conclusion unsatisfying, too. Overall: Not being able to offer a conclusion is a crime meriting severe penalty. I therefore cannot give Mass Effect Invasion more than 2.5 out of 5 stars, which is a pity given how well it fared till then. Bioware recently solved the mystery of Mass Effect: Invasion's lackluster ending by announcing the release of Omega, a Mass Effect 3 DLC. Apparently, you (as in, Commander Shepard in the single player campaign) are meant to help Aria take Omega back from Cerberus. For $15 you can find out how this comic should have ended; in the mean time, read here about this upcoming DLC. At least now we know this whole comic thing was nothing but a prelude to us opening our wallets further.